Our team is committed to providing educational events such as this to help improve the lives of individuals with multiple lower extremity limb loss. 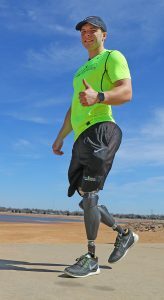 Bilateral above knee amputees have a unique situation to overcome in order to have success with successfully utilizing prosthetics. That is why we developed our specialized approach to address this specific patient population. When all of the various aspects are optimized for the individual with bilateral above knee limb loss, amazing results can be achieved. Each person has a different set of goals that they would like to accomplish with using bilateral above knee prosthetics. Our goal is to help each person maximize their individual functionality and assist them in reaching their goals in the most efficient way possible. The purpose of our Bilateral Life Camp is to bring together individuals that share similar limb loss in order to learn what is possible and to help them develop or enhance their skills as a bilateral above knee amputee. We developed this concept and we are committed to expanding our training camp each year and continue to have a positive impact on the lives of bilateral above knee amputees worldwide. Hayden Bailey enjoys driving any vehicle without using any adaptive devices or modifications. Hayden lost both legs above the knees in 2013 due to a single car accident. Almost six months post injury, Hayden was living his life as a full-time prosthetic user utilizing "stubbies". As he built up his strength and endurance, many of his daily activities became much more efficient and even enjoyable as he fully incorporated his prosthetics into his daily life routine. Hayden is very thankful for the many bilateral above knee amputees that helped to encourage and inspire him to become a successful prosthetic user. 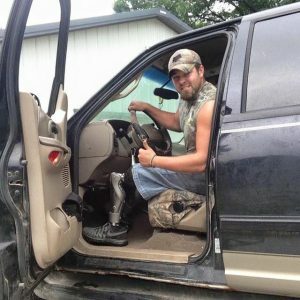 Now it is his mission to "pay it forward" to as many bilateral above knee amputees as he can reach. Initially, he was told that his life would be greatly limited by his "disability", but what he discovered is that any limitations are self imposed. Anything is possible with excellent prosthetics and instruction combined with determination and commitment. Kyle Hannon utilized "stubbies" during his initial recovery, however, still uses them today for various activities. 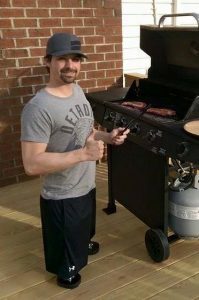 In September 2014, Kyle was a railroad switchman at a steel mill when he was unexpectedly struck by a rail car while at work. The momentum dragged him under the rail car about 50 yards before coming to a stop. His extensive injuries would result in the amputation of both legs very high above the knees. Kyle was in great physical shape but learning to walk again would prove to be an extreme challenge. But his motivation would be his newly born daughter and he focused on getting out of the wheelchair as soon as possible. The added challenge of having very short residual limbs would make walking even more difficult. But with a unique approach to socket design, he would have the tools to begin the process of living his life as a full-time prosthetic user. Today, he has several different prosthetics that he uses for different activities. The microprocessor controlled knees are very functional for everyday challenges, but the "stubbies" are very handy for cutting and carrying tree branches around his home. Seth was 16 years old when he lost both legs above the knees in a tragic car accident. Seth was active in many high school sports which helped him to focus his strength and attitude towards utilizing bilateral above knee prosthetics. Seth is pursuing a career in the prosthetics profession and one day is planning to become a certified prosthetist. He has not used a wheelchair since April 2012. He has shared his message of hope and inspiration at various public events and school assemblies. He is dedicated to making peer visits with other bilateral above knee amputees to help them navigate their physical challenge. His passion is participating in long distance running events and enjoys working out in the gym at least three times a week. Seth will provide insight into a healthy lifestyle that can greatly benefit a full-time prosthetic user. *This event is ONLY for individuals with bilateral lower extremity limb loss and accompanying family members. It is not for prosthetists, therapists or other medical professionals as the scope of the daily sessions is designed for individuals with bilateral lower extremity limb loss. This event is not for individuals with bone anchored prosthetics.